Walk in the doors of the Everhart, take a peek to your left, and you'll see what almost everyone ends up talking about. THE DINOSAURS! We have many items on display, including fossilized shark teeth, ancient horse bones, mammoth teeth, and much more. And we bet you didn't know that most of our plant fossils are from right here in our backyard. In fact, they're what helped make the coal that made northeastern Pennsylvania famous around the world. 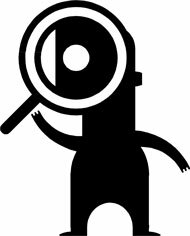 Check out some more interesting information about our fossils below. The word trilobite means "three-lobed fossil." Take a look! Can you see the three parts that make up its body? Trilobites had three main pairs of legs for getting around (and lots and lots of smaller ones), antennae for tasting and smelling, and eyes - yes eyes - for seeing. Scientists think some trilobites could only see light and dark, while others could actually see quite well! Trilobites appeared some 600 million years ago. They lived in shallow seas, and we think they swam, and crawled and burrowed in the ocean floor. If you look closely at the fossil to the right, it might remind you of a bug. In a way, you're right! 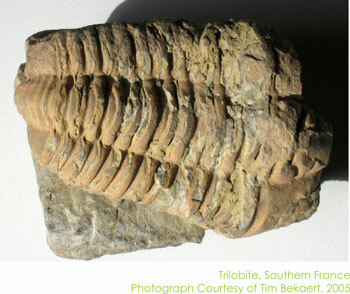 Trilobites are part of the family of animals called arthropods. Arthropods have segmented bodies, jointed legs, and an exoskeleton (a hard shell on the outside of their body, instead of bones). Other arthropods are animals like lobsters, centipedes, spiders, insects, and many more. Trilobites went extinct some 270 million years ago, but today we can find their fossils all over the world. Pennsylvania, in fact, is a great source of trilobite fossils, and has named the trilobite as its state fossil. What do you think this tells us about how Pennsylvania looked 400 million years ago? Stegosaurus in Greek means "the roofed lizard." Take a look. Can you figure out why it got that name? 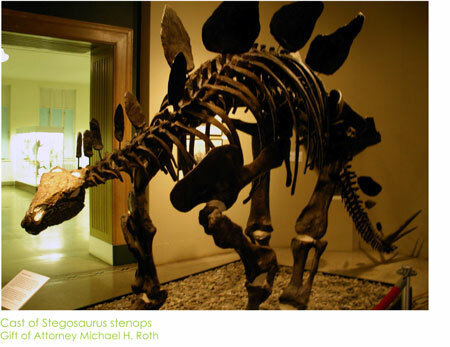 There are many types of stegosauruses that lived all over the world, but ours, Stegosaurus stenops, lived in western North America - like Wyoming - some 200 million years ago. Usually, stegosaurus was 18 to 30 feet long, 13 feet tall, and weighed 4 to 10 tons. But even though it was so big, it had the smallest of all the dinosaurs' brains. It was only about the size of a walnut! Stegosaurus was a herbivore, meaning it ate plants. To help it tear leaves, it had a beak. It also swallowed stones to help it digest its food. If you hadn't figured it out, the plates on its back are what gave Stegosaurus its name. But what were they for? At first, scientists thought they were for protection. But if you look closely, the plates wouldn't protect its sides. They also weren't hard, and weren't well-attached to the body. Now scientists think these plates helped the stegosaurus control its body temperature, allowing blood to heat up or cool down quickly. For example, on a cool morning, the dinosaur could stand sideways to the sun to warm up. Or, if it got too hot, it could face the sun head-on, or move into the shade. Elephants and jackrabbits today do much the same thing with their ears. Without a doubt, you know who this dinosaur was. This is the famous Tyrannosaurus rex, or T-rex for short. Tyrannosaurus means "tyrant lizard king." A tyrant is a ruler - like a king - who is very harsh and cruel. Looking at this skull, with its powerful jaws and sharp teeth, I bet you can see why he might have been given that name! T-rex lived at the end of the Cretaceous period, 67 to 65 million years ago. It stood about 18 feet tall, was 40 feet long, and would have weighed about 5 tons. Because of its size, for many years it was thought to be heavy, slow, and dim-witted. Today, however, most scientists think it was actually very active, and probably warm-blooded. T-rex's skull was about five feet long, and its powerful jaws were attached at several points so it could take large mouthfuls. Its teeth were large (about seven inches long), serrated (like a saw), and able to crush any bone. Similar to sharks’ teeth, they grew in rows, and were replaced if broken or lost. 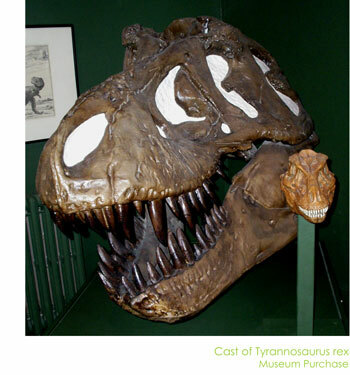 Tyrannosaurus rex had many other amazing senses. Its skull had a special nasal bone, which allowed it to smell extremely well, catching scents - like blood - up to six miles away! T-rex did not have ears like us. Instead, in its ear cavity was a resonator - a large fluid-filled sac - that would vibrate and make whatever it heard louder. As for its eyes, it's believed T-rex had the largest eyes of any land predator. Moreover, with its eyes on the front of its skull, T-rex could see movement and distance. You might have heard in the movie Jurassic Park that T-rex couldn’t see what didn’t move. In fact, Tyrannosaurus had excellent vision and could see its prey without any trouble! You've probably never heard of Charles R. Knight, but he was an amazing and important scientific artist. He made sculptures, illustrations, and paintings, and often wrote the text that explained them. His talent is especially impressive because he was partially blinded as a child by a rock thrown by a playmate. Knight did most of his work at the American Museum of Natural History in New York City. There, he worked with paleontologists and scientists to help create displays for the museum's fossil collection. But more importantly, he tried to imagine the prehistoric creatures as alive, and then make drawings and murals to show how they might have looked millions of years ago. To do this he looked at modern animals - like horse, crocdiles, and crabs - that had the same characteristics as the extinct ones. His work can bee seen in museums throughout the United States, like the Field Museum in Chicago and the Natural History Museum of Los Angeles. 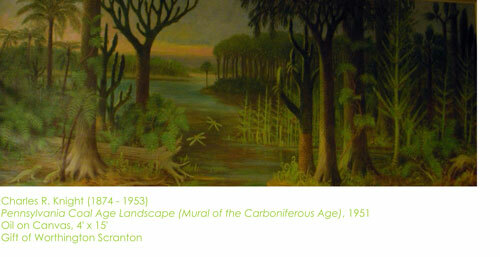 In 1951, Knight completed a mural for the Everhart Museum. It was his last one before he died. This mural - Pennsylvania Coal Age Landscape - shows Knight's amazing ability to recreate things from the past. Here, you can see what Pennsylvania might have looked like some 300 million years ago. The area was very similar to the Florida Everglades today, covered by great swamps and lots of plants. Many thousands of years later, these became the anthracite coal fields of eastern Pennsylvania. The coal also preserved many plants, most notably the Lepidodendron and Sigillaria, which are on display in the Everhart. In the mural, you can also see some insects and early reptiles.